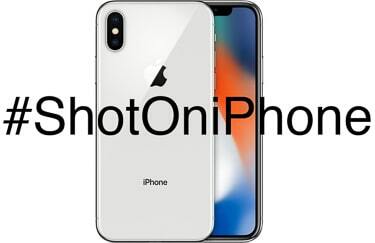 Anybody who has ever put any belief behind the ad campaigns produced by Apple showing incredible photos and video #ShotOniPhone has wondered exactly what they did to produce those amazing images. While there are often extreme measures taken to capture some of those images, this article on 13 iPhone X Camera Tips You Won’t Want to Forget should help you to improve the images you take with that omnipresent camera system. It should be noted that most of these tips can be applied if you own any of the other iPhone models or even other camera phones. This is a great place to start immediately improving the quality of the photos you capture with your iPhone. The pitfall you are immediately battling when you grab for your iPhone over your DSLR or Mirrorless camera is in the fact that you are working with a MUCH smaller lens in front of a MUCH smaller sensor. What this means is that your iPhone is not all that good at collecting light. Yes, that statement applies to the iPhone X as well. When light collection is inefficient, noise can become a problem quickly. But don’t fret, I have a solution. Add light. It really is that simple. Turning on every available light will immediately enhance the quality of your image. The lights in your house are most likely placed up high (probably near or in the ceiling) and they will be familiar and flattering. This will immediately improve your photos making them sharper and reducing overall noise. This is clearly related to the first tip. More light = better iPhone photos! iPhones have the tendency to not use the built-in flash as much as they should. Now, while it is a point light source and thus a harsh light source, it is also probably not strong enough to overpower your ambient light. Rather, it will add to it as a fill and reduce overall noise in the image. Since the ambient light is still present, you shouldn’t end up with harsh, ugly shadows. That is, unless you ignored the first tip. Just make sure you’re not expecting the flash to cover any great distance. It has an effective range of about 7 feet before the inverse square law renders it less than useless. Do be aware of the possibility of your flash not matching the ambient light in terms of color temperature. This is supposed to be less of a problem with “True Tone” flash. However, the lighting in a house tends to be very warm and can really give your flash away. Play around with it and see what works best in your given situation. One place where the limitations of a mobile device for photography start to become more apparent is when trying to take advantage of the physics of optics to do things like create a shallow depth of field. Enter computational photography. This is going to be a buzz phrase as we move into the future of photography. A huge strength of the iPhone X camera (like the 7 plus and 8 plus) is the ability to recognize the subject, separate them from the background and create a fantastic and convincing bokeh. While it’s not perfect, it is pretty darn good and getting better with each iteration. While in the main camera, simply swipe into “portrait” mode and the camera will do the rest. You will notice that it doesn’t work horribly well up close but you must be close enough for it to separate the subject from the background. 7 to 8 feet works pretty well. The phone will actually tell you things like “Move Farther Away” or “Place subject within 8 feet” to help guide you to the optimum subject distance to make the feature work. Also, be sure that your background is a decent distance behind your subject. This will help the system work better. The software takes over and creates a great bokeh that will separate your subject from the background and improve your portraits. 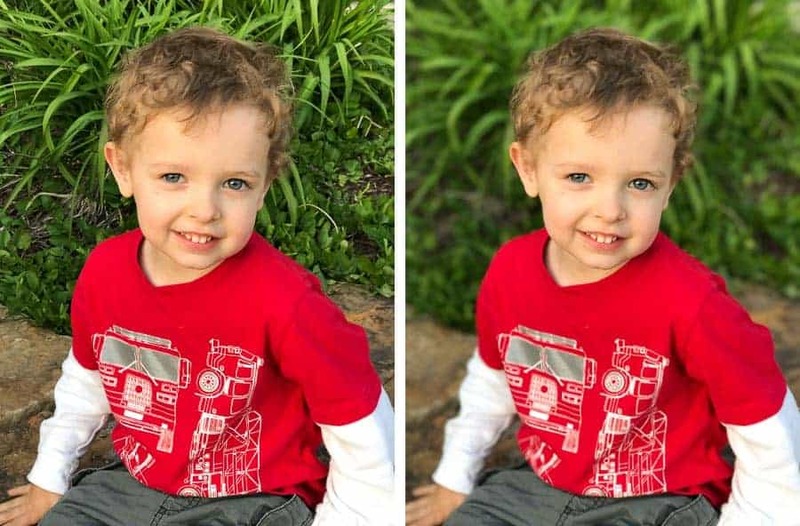 Same image with and without portrait mode engaged. It's no 135 f/2, but it's definitely an improvement. If you’re living in the world of the iPhone X, you also have access to the lighting adjustments in portrait mode. My early experience with these has been far from perfect, but the concept behind them is intriguing to say the least. 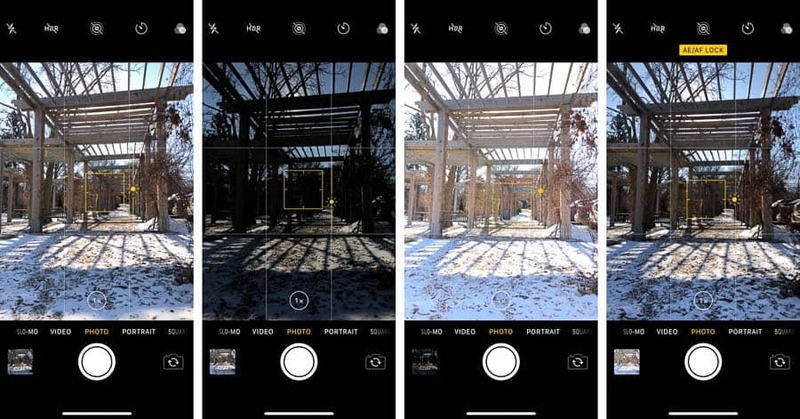 An often-underutilized functionality built into the iPhone experience, dating way back to the early versions of the iPhone Camera app, is the ability to control the exposure. Many people simply stumble onto the feature while those who are informed read about it right here on Improve Photography. The way this works is by simply touching the screen where your subject is. This sets the focus point on the image. Now, with your finger still touching the screen, drag it up and down to adjust the overall exposure. Now you’re in a perfect position to nail your iPhone photo exposure every time! This works especially well with subjects like sunsets where the camera wants to automatically select an exposure that is far too bright, blowing out the details in the sky. Drag down to “under-expose” and boom… perfect sunset shot. Another level of functionality in this feature is the ability to lock exposure and auto focus. Once it’s set how you like it, just hold on the screen for two seconds and you will see the AE/AF lock indication pop up. You can then recompose your image without the camera changing focus or exposure settings. This one drives me crazy and I’m not sure why it bothers me so much. Perhaps it’s because I see people do it all the time and I know they’re only doing harm. When I say all the time, I mean ALL THE TIME. Probably more often than not actually. I’m talking about “zooming” by using the pinch gestures on screen. Technically, you can’t zoom on an iPhone. Zoom would be changing the optical focal length of your lens. Pinch “zoom” is digital “zoom” and amounts to a simple cropping of the image. Of course, with the X and with the Plus versions of the iPhone, there is the option to use the second “2X” camera. But this is really more of a lens swap, or technically it’s a complete camera swap to a different system, different sensor, everything. Note: There is a HUGE caveat with the “2x camera” that I discovered while writing this article. When lighting conditions are not optimal, the iPhone camera app always uses the main 1x camera and when you tap 2x, it uses a digital “zoom”. This is because the 1x camera has a slightly larger sensor and a slightly brighter aperture. In order to know if you’re actually utilizing the 2x optics, cover the telephoto lens (leave the main lens unobstructed and that is how you’ll know you’re covering the correct lens) and switch to “2x”. If you’ve actually switched over the image should go dark. If it does not, you are using “digital zoom” and you’re better off just using the 1x camera. Pinch zooming is really just cropping the image live and then taking the photo committing the photographer to the exact composition they had when they hit the shutter. A far better approach would be to take the photo without zooming in and then crop later to get the desired effect. Then there is time to make it perfect and/or change it later on. A sort of non-destructive workflow applied to capture in-camera. Left: Uncropped original sample; Center: Cropped in Post; Right: Pinch “Zoom”. Notice no real difference between cropped in post and “zoomed” except that with the zoom example, I cannot go back and play with it. The other alternative, and one that is especially useful if you do not have one of the iPhones with the handy two camera setup on the back, is a set of clip on lenses that can be attached to your phone. There are tons of these on the market and many of them actually work quite well (see tip #8)! This one might seem obvious, but I want to point out a couple of less obvious ways to use this feature. First, the obvious. Sometimes you just want a panorama. Shooting several photos with sufficient overlap and then hauling said files into Lightroom or Photoshop or your editor of choice to merge to a panorama is simply too much. So, engage panorama mode, start the exposure and slowly pan from left to right. Done. One spot where it might not be so obvious to use a panorama is in a situation where you don’t necessarily need the sweeping 180-degree view. You can take short panoramas (is that a contradiction in terms? I don’t care) you have my permission. This is a way to achieve a slightly wider angle of view both vertically and horizontally while, at the same times, adding a fair bit of resolution. Another useful tip with panoramas on the iPhone is to remember that they work in the vertical orientation as well. The process is the same, just hold your phone in landscape orientation at the start of the panorama and pan from low to high. Now you have a beautiful photo of a very tall subject in one shot. Panoramas can offer that wider angle of view when it is needed and they don't have to be 180 degrees wide. There is added benefit in increased resolution as well. The panorama mode comes with a couple of caveats and these are not unlike panoramas with larger photography equipment. You’re likely to have some significant distortion, especially if you’re close to your subject. This can sometimes be OK and other times it can be fixed in post. Moving subjects don’t play well with panoramas. Sometimes this can lead to some interesting stitching errors. This is obviously part of tip #6, but I gave it its own heading because it will help you just that much. It has to do with parallax and other forms of distortion that are possible when the camera moves rather than rotates. If you have no clue what that means, don’t fret, just understand that you will end up with superior results when you rotate your phone rather than your body with your phone out in front of you. The same principle is true when shooting panoramas with a larger camera system. The idea is to rotate around something known as the nodal point. With your phone, just think of the camera itself as the nodal point and you’ll probably be close enough. Throw a longer lens on and have objects near and far in the frame, and it becomes important quickly. Hold your finger up in front of your face about a foot or so away. Now rotate your head and notice that your finger appears to shift position as your head rotates. This is the same thing that is happening when you hold your phone out in front of you as you rotate your body to create a panorama. It can mess things up pretty quickly. Now try again, but as your head rotates, try to keep your finger and your target object lined up. If you are able to do this, you are rotating around the nodal point of your eye! Stitching a panorama that was taken with the camera rotating around this nodal point is much easier and much more accurate as the elements in the frame do not move relative to one another. 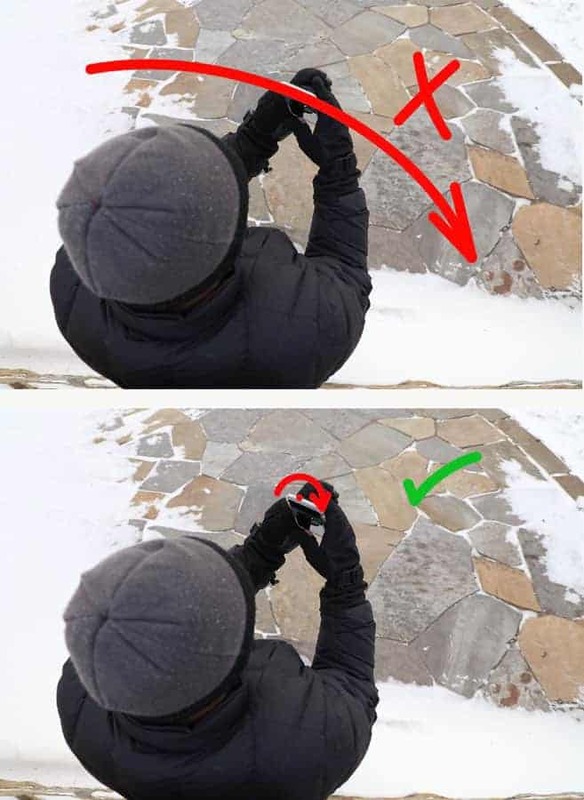 If you have a hard time with this, consider mounting your phone on a tripod as you would when taking a panorama with a larger camera system (more on tripod benefits in tip #9). As with more traditional photography setups, good glass is critical. External lenses are a great addition to your iPhone. Be it the X, or the 8 or any of the previous iterations. Now, obviously the X and the 8 Plus (as well as the 7 Plus) have the extra camera with the longer focal length but why would you want to stop at two setups? Right now, there are countless options for adding lenses to your iPhone setup, be it the X, 8, 8 Plus or any of the previous models. Oh, and the phones made by the other manufacturers too. I’d start by looking at the products offered by Moment and Olloclip. (Links will take you to their respective stores on Amazon showing all products). For reference; as of writing, if I were to outfit my iPhone X with the latest from Moment it would cost just over $400 and closer to $500 if I wanted the battery case. This would get me a case along with wide, telephoto, fisheye and macro lenses. There is also the option to look into the less expensive “clip on” lenses that are available. Be careful though as many do not sport stellar quality. 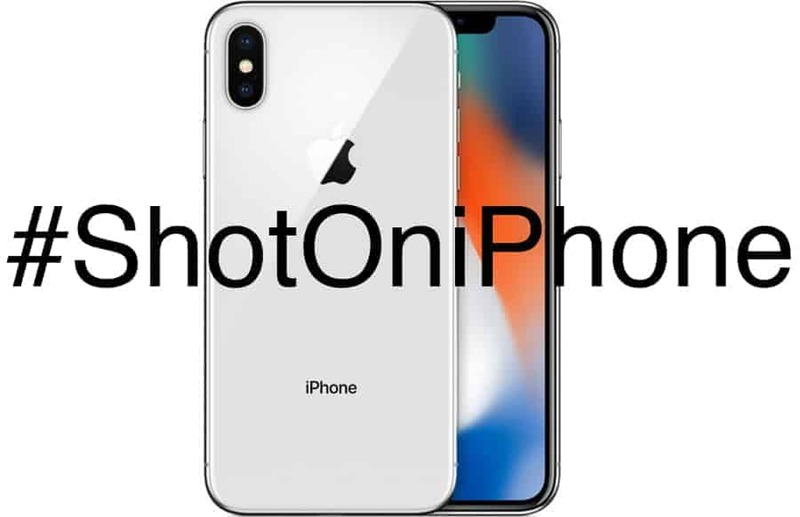 Now seems like a good time to mention that many of those #ShotOniPhone ad spots you see were indeed done with the iPhone, but usually use high-end lenses adapted for use in front of the iPhone camera to create final product. So, if you’re really into mobile photography on the iPhone or any other device, a GOOD set of external lenses might be worth the hefty investment. This kind of sounds like a general photography tip you’ve probably heard before, and it is. This is especially true when working in low lighting. Now, the iPhone X is not going to contend with its larger sensor equipped counterparts in low lighting (see tips #1 and #2), however it does hold its own when compared to cameras placed inside smartphones. A tripod will help to reduce camera shake that can be a result of the longer exposures needed in these low light environments. This benefit is especially true when using a 3rd party camera app to manually control exposure keeping shutter speeds long and ISO down. Longer shutter speeds equal more light equals less apparent noise. They also equal the need for a tripod. 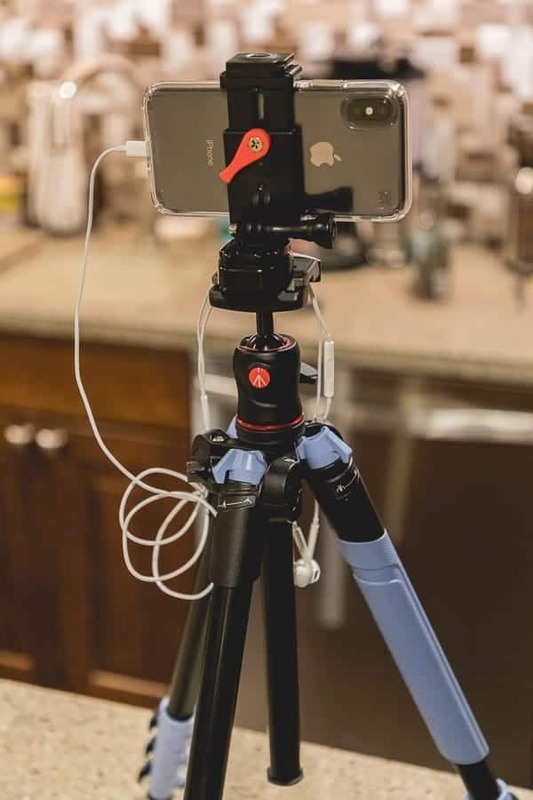 A device like the Joby GripTight Mount will help you to easily attach your phone to any tripod via the ¼ -20 thread. A handy little piece that you’ll hardly notice in your camera bag. Everyone knows about the iconic white ear buds that come standard with every iPhone. What not everyone knows is that the volume buttons that are built into those very headphones can be used as a cable release to avoid camera shake when taking a photo! Simply attach your headphones to your iPhone via the lightning port (using the supplied adapter with a normal 3.5mm headphone plug works as well) and when you’re ready to take the photo just click volume up or down. This functionality is an extension of the ability to use the volume buttons on the phone itself as shutter buttons. A helpful tip if you like the tactile properties of an actual shutter button. Or if you need the ability to trigger your camera without touching it. If you want to go a little more “high-tech” or you just plain love Bluetooth (and who doesn’t love Bluetooth?) you could try something like what I use, which is the Joby Impulse Remote Control. My iPhone X secured to a Manfrotto BeFree tripod via the Joby GripTight Mount. Ear bud volume buttons can be used as a shutter release! HDR is a very popular and yet often criticized technique in photography. The basic premise behind it is to create an image where detail is remains in the very bright and very dark parts of an image where both exist. Part of the limitation of cameras in general, and especially that one that you sometimes use to make calls with, is the lack of an ability to catch these details in the highlights and shadows. Your iPhone camera app has the built-in functionality to take multiple exposures and automatically blend them together into a seamless image showing all of this wonderful detail. It does it quite well I might add. The only real drawback is that if you have a moving element in your frame, the stitch can fail, just the same as with more traditional forms of image capture. HDR does not play well with moving subjects. When you have a scene that has a significant difference between the bright and dark parts and you want to maintain that detail and your scene lacks moving subjects, use HDR. Notice the detail retained in the HDR image created by the iOS Camera app, especially on the left of the frame where it is completely blown in the original. I love using my iPhone for video purposes. It does a fantastic job in a large variety of situations. Try not to forget that it’s there. Do pay attention to the settings as they must be accessed through the settings app in the iPhone (I really wish that I could change them on the fly from inside the camera app). The iPhone X will shoot at various framerate settings from 720p/30 frames per second (fps) to 4K/60fps. I should note that the 4K/60 option is not available in my Canon 5D Mark IV. So, in my case, this is a great tool! Be aware of the space required for the 4K/60 video though. Apple has a handy guide built into the settings screen showing you the space required for each framerate/resolution setting. In order to drastically increase the quality of your video, I recommend getting a gimbal for your phone. If I were to buy one today, I would gravitate toward the DJI OSMO Mobile. This device, or one like it is designed to stabilize your footage giving it a much more polished, professional look. When the quality of my iPhone captured photo has to be the best it can be, I utilize 3rd party apps for capture. Since iOS 10, Apple has allowed developers of these apps to leverage the RAW file that is produced by the camera. 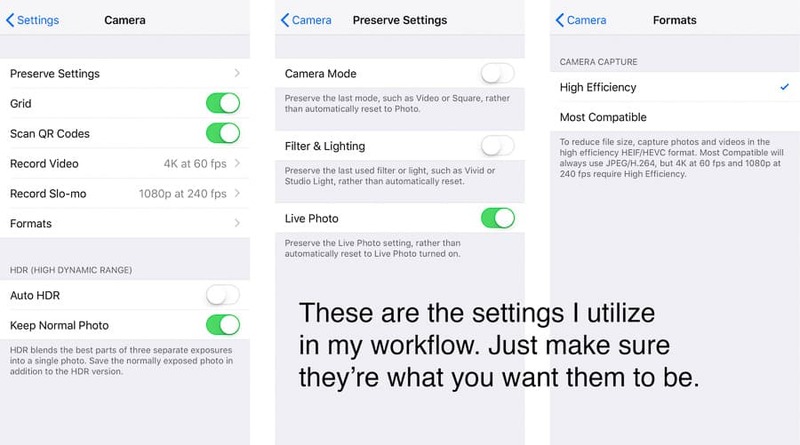 Many of these apps also allow for full manual control of the settings in the camera. These are two things not available when using the native iPhone camera app. I suspect that the reason these are not available in the native app is that Apple decided that the majority of users wouldn’t care or would just be confused by the added settings/options. I use several 3rd party apps but my go-to at the moment that works perfectly well with the iPhone X is Halide. There are many apps on the market and they all do very similar things just in slightly different ways. I like the interface of Halide and its iPhone X compatibility. It allows me to take full control and produce a high quality DNG file that can be processed in any number of apps/computer programs. It fits well with my approach to a mobile photography workflow. The camera feature built into Lightroom mobile works pretty well and automatically uploads to the cloud (like it or not). The handiness of this is that you snap a photo with your phone using the Lr camera and then by the time you get to your Lr CC or Classic catalog on your computer the file is sitting there ready for editing! If I need a snapshot, it’s the classic swipe left from the lock screen (or tap the phone icon in the X) and I’m ready to go. If I need something a little better, I open a 3rd party app. Screenshot showing iPhone X screen with Halide app running. Focus peaking is engaged and also the ability to control ISO, shutter speed, white balance and file type along with a live histogram for exposure information. One final word that applies to all tips is to pay close attention to the settings of your device. Your iPhone comes preset with some settings in the camera app that you’ll want to take a look at and possibly customize so that your experience is consistent and what you expect/need. In no way am I attempting to make the statement that the iPhone is ready to replace your larger, dedicated camera system for any and all situations but let’s face it…Your phone is with you all the time (You’re using it to read this article, aren’t you?). Your camera is probably not right at hand all the time and yet, there are moments that need capturing. I hope that you find the tips in this article helpful in creating the best image you can with the equipment you have at hand. Remember, the true nature of the image is not about the equipment, it’s about the photographer.